By age group, pediatric vaccines accounted for a 57.5% share in the global human vaccines market in 2015. Factors such as the high prevalence of pneumonia and polio among children across the world are likely to fuel this segment. On the other hand, adult vaccines are expected to expand at the highest CAGR from 2016 to 2024. North America was the dominant market for human vaccines in terms of revenue in 2015 owing to the growing demand for vaccination among adults and children. The market is also fueled by the increase in government efforts toward vaccination programs and the fact that most vaccines are available in the U.S. This report provides in-depth region wise and country wise analysis of the human vaccines market. Stakeholders of this report include manufacturers of human vaccines products, raw material suppliers, vaccine processing companies, and new players planning to enter the market. The report provides qualitative and quantitative analysis of the global human vaccines market. Qualitative analysis comprises market dynamics, trends, product overview, and country-level market information. Quantitative analysis includes market share held by companies in 2015, market size, and forecast for the global human vaccines market in major countries globally such as the U.S., Canada, Germany, France, United Kingdom, Italy, Spain, Japan, China, Brazil, Mexico, South Africa and GCC countries. Market revenue is provided in terms of US$ Mn from 2014 to 2024 along with the compound annual growth rate (CAGR %) from 2016 to 2024 for all the segments, considering 2015 as the base year. The executive summary of the report provides a snapshot of the human vaccines with information on leading segments, country wise market information with respect to the market size, growth rate (CAGR %), and growth factors. The market overview section comprises impact factors such as drivers, restraints, and opportunities for the global human vaccines market. These factors would aid the stakeholders in establishing a strong foothold in the global human vaccines market. Furthermore, the market overview section comprises key industry events, product overview, market attractiveness analysis and emerging trend in the human vaccines. The market attractiveness analysis provides a graphical view comparing the growth and market dynamics in various segments and country wise to identify the most attractive market. Market share analysis is also provided in the competitive landscape section of the report for the year 2015 in terms of value (%). Geographically, the human vaccines market has been categorized into North America, Europe, Asia Pacific, Latin America, and Middle East & Africa. Moreover, analysis for the major countries comprising U.S. Canada, Germany, U.K., France, Italy, Spain, Japan, China, Brazil, Mexico, and South Africa have also been provided in the report. 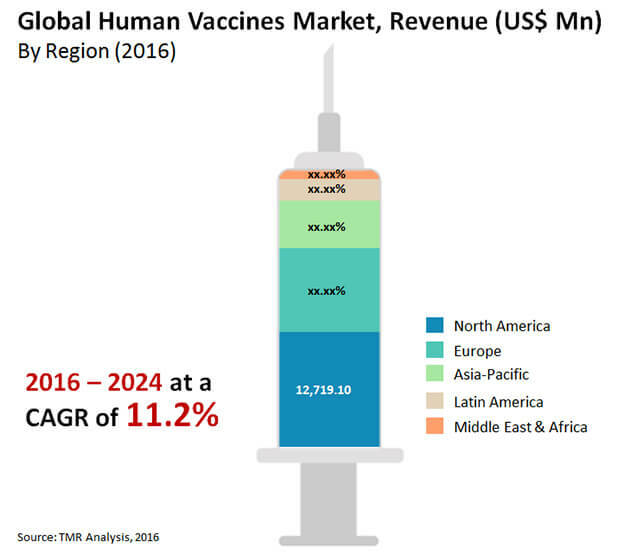 A detailed qualitative analysis of the factors responsible for driving and restraining the growth of the human vaccines market in various regions has been provided in this section. This report also includes various ups and downs about particular country or geography that has impacted the overall market globally. The report provides a detailed outline/blueprint of the human vaccines market globally that will assist new companies in establishing their presence and market players in expanding their market share in the market. The report concludes with the company profile section which includes company overview, financial overview, SWOT analysis, product portfolio, business strategies and recent developments for market players. The major players that are profiled in the report include Major players operating in the global human vaccines market include AstraZeneca, GlaxoSmithKline plc, Merck & Co. Inc., Pfizer, Inc., Sanofi and Johnson & Johnson among others.